Want to give your home a makeover? Not everyone has access to their own interior designer or a Grand Designs budget, but with a Furniture Village voucher code you can great deals on everything you need to create your dream home. Whether you just want to update your living room with some key soft furnishings or revamp the whole house from top to bottom, a Furniture Village discount code helps you get the home you want for less. Founded in 1989 in Abingdon, Oxfordshire, Furniture Village was set up to offer fantastic products, prices and services to their customers. Remaining true to those principles, Furniture Village is now the largest privately owned furniture chain in the United Kingdom, operating 40 stores throughout the country. Their focus is on providing excellent quality furniture for every room in the house, and they pride themselves on maintaining excellent relationships with their customers – many of whom return time and time again. A family-run business offering value for money and flexible payment options, Furniture Village aims to help its customers make their house into a home with friendly, knowledgeable staff always on hand to assist with any queries or make suggestions for specific spaces. Their online store carries a huge range of stock, with everything from beds and bedroom furniture to dining room tables, sofas, sideboards, cabinets, lighting and more available to purchase for delivery straight to your door. Furniture Village's buyers travel the world to find the very best furniture in every style imaginable – from minimalist and modern to traditional and classic. They even commission unique pieces that are available exclusively through Furniture Village. With a diverse and varied stock combining big brand-name furniture with one-off designs and finishing touches from smaller, more quirky designers, Furniture Village has absolutely everything you need to create your dream home, one room at a time. Furniture Village is always on the look out for new styles and brands, so there's always something different to discover. For example, in recent years the company has been exploring ways to utilise technology to create the ultimate comfort through power recliners and power adjustable seating, as well as working towards bright ideas like furniture recycling to ensure that nothing goes to waste when you're revamping your home. Want to get shopping with Furniture Village? With a Furniture Village voucher code you can make great savings on a wide range of furniture for your home. Whether you just want a few new bit and pieces to brighten up a room or a full overhaul of everything from bedroom to bathroom, a Furniture Village voucher can help. Browse our website until you find a Furniture Village voucher code that's right for you, then navigate to their website to begin shopping. Enter your Furniture Village discount code in the box provided then click 'Apply'. Want to find out more about the fantastic products on offer at Furniture Village? Why not visit their dedicated YouTube channel? You'll find lots of additional features such as guides to choosing the right furniture, interior design hints and tips, supplier showcases and more. You can also use this channel to find out more about saving money with a Furniture Village voucher. If you like the range of products on offer at Furniture Village, why not check out Homebase or Ikea? Or if these aren't quite up your street, there are plenty of other shops to choose from in our Home and Garden section. Enter your Furniture Village voucher code in the box provided then click 'Apply'. Enter your payment and address details and click 'Continue'. Delivery charges on items vary dependent on the size and weight of the product that you order. You can collect your furniture for free from Furniture Village stores around the country. Need to contact the team at Furniture Village? 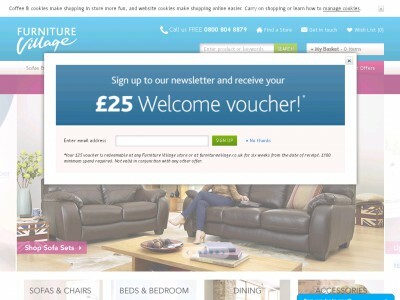 Whether you have a question about your order, want to learn more about the quality products stocked by Furniture Village or you just want to find out how you could make big savings with a Furniture Village voucher code, you can contact the Customer Services department by filling in the online contact form here. Want to find out more about what's happening behind the scenes at Furniture Village? The company maintains a profile across all your favourite social media platforms. Follow them for competitions, product reviews and features, interior design tips and more. You can also use these pages to find out more about saving money with Furniture Village discount codes. Don’t forget to check them regularly, as you can never be sure when a free Furniture Village voucher might be waiting for you! Buy now online at www.furniturevillage.co.uk. We didn't have much money when we moved into our first home, but with Furniture Village vouchers we managed to get everything furnished without breaking the bank. We just visited furniturevillage.co.uk, entered our Furniture Village voucher code and enjoyed great savings on everything from bedroom furniture to the kitchen sink. Our Furniture Village voucher let us get everything we needed without worrying about paying the mortgage at the end of the month. So if you're a homeowner on a budget, check out what you could save with a Furniture Village discount code.